International electron market conditions reports, on May 14 evening, announcement of Inc. of semiconductor of Shanghai Wei Er says, because the company is planning,buy Beijing limited company of science and technology of power of a person of extraordinary powers, Beijing thinks of the equity that compares Inc. of division microelectronics technology, this item forms major asset to recombine, should trade of item basically trade the other side promotes equity of city Wei a person of extraordinary powers to invest fund partnership business for carry on (limited partnership) , Qingdao be in harmony is connected civilian with investment center (limited partnership) , equity of Jia Xingshui Mu Haowei invests partnership business (limited partnership. 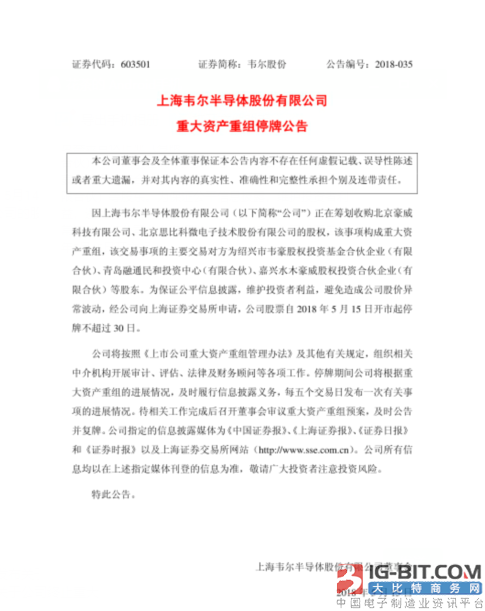 To make sure fair information is announced, maintain investor interest, avoid to cause company share price unusual wave motion, classics company applies for to Shanghai stock exchange, company stock stopped a card not to exceed 30 days since reopen after a cessation of business on May 15, 2018 oneself. This has been Weierdi is initiated 2 times buy Beijing science and technology of power of a person of extraordinary powers. June 2017, wei Er semiconductor releases major asset to recombine progress announcement, subsequently, on September 25 evening, wei Er share issues the announcement that recombines about stopping major asset. Announcement says, on September 24, wei Er share held meeting of board of directors, discuss and passed ” what stop major asset to recombine item about the company is second reading ” , agree to stop this second major asset recombines item. What its recombine mark is Beijing a person of extraordinary powers power. After recombining failure for the first time, beijing a person of extraordinary powers power produce heavy upheaval. Was on September 29, 2017, beijing a person of extraordinary powers power undertook great ways of the world adjust, beijing a person of extraordinary powers power Yu Renrong of president of share of Er of CEO You Wei is taken up the post of. 2 be, in December 2017 Beijing a person of extraordinary powers power partner undertook modificatory, hold a Zhuhai of single the largest stockholder of about 11.79% sharp edge of be in harmony is exited (Zhuhai be in harmony sharp edge Zhang Xuezheng of effective control person is president of Wen Tai science and technology, the hearsay buys OV in Wei Er semiconductor when, zhang Xuezheng president cast blackball) , exit at the same time still have hold Beijing a person of extraordinary powers power the Shenzhen estimate of 1.73% share. Such case is opposite it seems that of Wei Er be initiated again and buy oriented and favorable situation. This, wei Er semiconductor plans buy Beijing a person of extraordinary powers power, the condition is more mature, succeed extremely likely. Beijing a person of extraordinary powers power advocate business Wu is made for image sensor chip, it is the bibcock of image sensor market for a time, for malic IPhone much money mobile phone supplies sensor. But sequel, the Buddhist nun of direct competitor all alone of the company and SamSung have the aid of at be in in low end of the market extend quickly, overtook gradually American a person of extraordinary powers power. At present the market of the company is had rate it is about 12% , row whole world the 3rd, be next to Suo Ni and SamSung. Think of than division advocate the research and development of chip of sensor of battalion CMOS image and relevant product and sale. Wei Er semiconductor advocate the design of research and development that business Wu is the semiconductor product such as semiconductor schism parts of an apparatus and IC of power source management, and passive, the cent of the semiconductor product such as structural parts of an apparatus, schism parts of an apparatus and IC sells business. Business income of Wei Er was 2.406 billion yuan 2017, among them semiconductor cent sells business to realize income 1.675 billion yuan, relatively go up year of growth 16.24% , occupy than 69.62% , semiconductor design professional work realizes income 721 million yuan, relatively go up year of growth 1.43% , occupy than 29.97% . Company semiconductor component sells business to basically be accredit representative cent to sell, firm downstream client tells manufacturer of aircraft of a famous player and plan design company for home more. In recent years, what wait for market of electric subclass product as mobile is arisen, company component sells business dimensions dilate rapid, cent sells business to hold proportion of business gross income taller. Current, below smooth treasure of company main representative, pine, South Asia, heaven and earth, country the product of the famous semiconductor manufacturer such as gigantic, Molex. Company component sells business wool interest rate for 14.37% . Since the company holds water oneself, take the research and development of technology of own intellectual property and product seriously all the time, the core structure that masters the parts of an apparatus such as circuit of chip of TVS, MOSFET, power source government, radio frequency and critical process make Cheng. 2018, the capital that the company will continue to increase system of research and development is devoted, the own intellectual property that safeguards company core technology is formed, have market of core technology translate into the series product of extensive demand. The company studies oneself product wool interest rate is 34.30% . 2017, company research and development throws 101 million yuan, grow 23.61% compared to the same period, the proportion that holds business gross earnings is 4.21% , investment of research and development of semiconductor design business occupies semiconductor to design scale of business sales revenue to achieve 14.04% . This shows, at present cent sells business to remain the main income source of Wei Er semiconductor, have great majority proportion, meanwhile, wei Er also is strengthening semiconductor research and development to design a level ceaselessly, increase investment of research and development, the cent with powerful have the aid of sells a system, implementation is bigger grind oneself the product develops. If buy a success this, will realize big changeover directly, its semiconductor research and development designs business certainly will to will exceed cent to sell the battalion that business brings close. Only from Beijing power of a person of extraordinary powers is mixed think of close to look than the battalion of the division, 2015, 2016 1-9 month a person of extraordinary powers power realize business income respectively 842, four million nine hundred and fifty thousand three hundred yuan, 642, six million five hundred and eighty-two thousand nine hundred yuan, realize net profit respectively 47, nine million and eighteen thousand four hundred yuan, 75, two million seven hundred and forty-nine thousand one hundred yuan. Wei Er semiconductor is domestic minority a few have semiconductor product to research and development is designed and part one of companies that sell capacity formidably at the same time. Company sale channel already spread all over manufacturer of brand of domestic mainstream mobile phone and program trader, set subsidiary respectively in and other places of Hong Kong, Beijing, Shenzhen, Suzhou, Wuhan at present, cent sells business network to cover the throughout the country, cent sells a product to cover consumptive electron (wait like mobile phone, flat) , notebook computer, car carries an electron, how to prevent the domain such as ammeter of communication of monitoring, network, intelligence, electric home appliances<gj, industry and new energy resources. Additionally the company is developing Taiwan market actively, establish the technical joint development of lasting effect and market sale mechanism. Future, have design of research and development and cent to sell double dominant position, the former plant of Wei Er semiconductor and cent sell the synergism of dual role to will give out bigger energy.